Do you think Nazism was a murderous ideology? Well, Nazism was child’s play compared to this ideology. This ideology has murdered and oppressed tens of millions of innocent people. Even worse, this ideology still exists today: it is the official government ideology in North Korea, Vietnam, China and Cuba. Even more disturbing, you never hear about the millions of victims of this murderous ideology. Furthermore, you never hear that this evil ideology was created and spread by Jews . In fact, this ideology came close to enslaving the world. It was only dumb luck that this ideology didn’t take hold in the Western countries, even though that was the goal of this ideology’s founder. Hey Socrates, I believe this picture is Baracke X in Dachau. The big crematorium building. If you google it you will find several pictures of the building with the corpse pile. There are several famous photos of this building with the mountain of emaciated corpses in front of it. What gives it away is the wooden shed behind the corpses in front of the building. It’s on all of these pics which were taken in spring 1945 by the Americans. The corpses are typhus victims. The commies had similar conditions in some of their camps, but this is not one of them. Something tells me you won’t find any pictures of Soviet camps…….owing to their extreme secrecy and the fact they were never invaded and conquered for defying the will of the Chosen. No one in the West can admit the crimes of Communism. The generation alive today is the generation that supported Josef Stalin and fought alongside him to destroy the white nation in Europe that might have saved the white race. The “Greatest Generation” is the generation that made it possible for Communism to claim it’s hundred million victims in Russia Ukraine Rhodesia China … Would you go to your father or grandfather and tell him he fought on the wrong side in the war? After everything he did, all the friends he lost, all the sacrifices he made? Would you even have the heart to tell him that? Solzhenitsyn makes the same claim in “The Gulag…”, when it comes to listening for someone in the West to speak up about the crimes of Communism… crickets. For those alive today to point out the crimes of Communism they would have to admit their own complicity. George Lincoln Rockwell was one who was brave enough and honest enough to admit that he fought on the wrong side in WWII. Even Churchill at the end of the war, when it was too late, said “We killed the wrong pig”. General Patton finally realized he fought the wrong side in the war and is said to have been assassinated for advocating continuation of the war against the Communist Russians. Has there been even one “crimes against humanity” trial for any of the Communist monsters who revelled in the destruction of whole nations or classes in society for the sheer joy of revenge and annihilation ? These are the best books I’ve read that begin to convey the Hell on Earth that some euphemistically call Communism. There are a few photos in “The Red Terror in Russia”. If anyone’s interested, here’s another good look at what you get with your Communist utopia. In the case of Ceausescu there was still no trial, just street justice. The Dachau “gas chamber” ceiling, lowered or not? Hitler saved Europe from communism but he couldn’t save Europe from the Europeans! I think the European leaders today (the EU, or EUSSR) ARE Communists, crypto-Communists, as is Obama. Today they are not the “to the barricades” revolutionary Communists of Lenin’s day. Today they call themselves Progressives. Whenever you hear the word “Progressive” you should complete the sentence. What THEY mean by progressive (without saying so in so many words) what they mean by “progressive” is the progressive, step by step implementation of the full blown Communist agenda and takeover of America. It’s the “boiling frog” slow motion coup d’etat that’s still going on in America, and in Europe. All roads lead to Washington City—The Jew Capital of the world. Follow the money—The taxpayer money. No White man worth his salt is afraid of communism. If communism comes to your door, repulse it to the last extremity. It was the Jew loving Christians who allied with communist Russia in WW2. 90 million? Really? I’m certainly no Red sympathizer but come on, not even the so-called Spanish Flu pandemic of 1918-1920 killed that many people. At a rough guess I would say Lenin, Stalin, Beria, Dzherzhinsky & co. were directly responsible for killing off 10-15 million people through mass-executions, starvation, forced relocations and the gulags from the period 1918-1953. Let’s not engage in the same kind of wild exaggeration that the Enemy does. I don’t know how many Chinamen were killed off by Mao and his henchmen but let’s face it, the Chinks die off like flies all the time. That’s why they breed like flies. People who promote the ‘commie scare’ throw out bigger numbers than Jews and the phony holocaust. Enemies of the White race promoted the’ commie scare’ to maintain the Cold War. The enemies I speak of had children in elementary school crawl in silence under the desk— conditioning them to be obedient police state citizens. We were told the communists were going to drop an atom bomb on our school. 6 to 10 million Ukrainians were starved to death by Stalin alone. 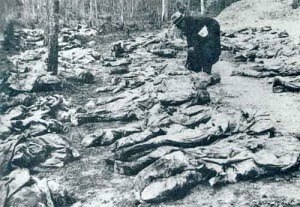 Ukrainian families were reduced to cannibalism, eating their own children that died in order to try to keep the remaining children alive. 60 million is the number murdered by Mao in Communist China, out of a billion, so you probably never noticed. The death toll in the Soviet Union 20-30 million maybe, they didn’t keep detailed records. Try reading some of the books I listed. The authors explain much better than I ever could not just the numbers but the incomprehensible horrors of each murder wrought by Communism, and of the torture and terror that preceded so many of those murders. The whole point of the article is that the supposed Holocaust is thrown in our faces every day and yet people not only do not remember the death toll from Communism, a death toll which is an order of magnitude greater than the supposed Holocaust, they are not even aware of it, or when informed, they deny the hundred million out of hand. Christianity conquered Europe with fire and sword. Christian wars killed off a 3d of the European population. Christianity and communism were invented by the same people. Christians and communists united to destroy Europe in the 20th century. Which group killed off the most people? I can’t tell. White people who want to upstart the ‘commie scare’ are race traitors. They want you to crawl under the desk and hide. They want to increase the military industrial complex to wage perpetual war. Chandala hit it right on the head about the people who call themselves “progressives” actually being crypto-communists. As part of my duty in G-2, I was assigned for a time to one of our POW units. During interrogations one day, one of the prisoners claimed that an American general, who had been captured during the early days of the conflict, had gone over to the Commie side and was commanding one of their units! Never found out if this was true. After being rotated back to the states, I kept watch for any news about him. When they began repatriating prisoners, I did see him on TV in one of the first batches released, but never heard whether that claim was ever investigated. Hitler called himself “The Destroyer of Marxism”. Speaking of Hitler, I’m reading Leon Degrelle’s “Hitler Democrat”. Great book by the way, by one of the Twentieth Century’s most heroic warriors, and authors. He also wrote “Campaign in Russia: The Waffen SS on the Eastern Front” and “Epic: The Story of the Waffen SS” and much more. They should all be required reading… but I won’t hold my breath. Unfortunately much that he wrote was not just censored and suppressed, much of what Leon Degrelle wrote was stolen and destroyed. Hitler – “The Destroyer of Marxism”. By the way again, some of Degrelle’s books are available from the publisher The Barnes Review at better prices than at Amazon I think. And the publisher, Willis A. Carto, deserves a lot of credit for making some of these books available, against great opposition. Pre-World War II, Hitler’s 3d Reich was welcomed by Iran to use it as a Middle East base for agitation against the British and the region’s Jews. Oil was also a factor. Hitler had no ambitions to destroy Islam. He focused on repulsing communism and Jewish Democratic Capitalism. I didn’t say Hitler wished to be the “Destroyer of Islam”, I was suggesting that it would be a good thing if there was a leader today who could see what is needed so clearly that he would call himself “The Destroyer of Islam”, as Hit’er called himself “The Destroyer of Marxism”. In fact, I’ve never been able to understand Hitler’s view of Islam. He even stated that if he had to choose a religion for the German people he would prefer Islam to Christianity. And I’ve read both Mein Kampf and the Koran and I’ve had to wonder a couple of times if maybe Hitler plagiarized the Koran. But even Hitler admitted that he changed his views along the way. Maybe he just couldn’t see a hundred years into the future to know what a pestilence Islam would become, once the West gave it a trillion petrodollars with which to work is Satanic mischief. This ideology is alive on the kwa. A white, male in the workplace is reduced to slavery by PC and feminist, power hungy, managers. ‘Seems you have some criticisms of Christianity. I regard Christianity as one of the main forces paving the way for the destruction of the West by Islam, to make a long story short, because of Christianity’s “pathological altruism”. Ben Klassen provided one of the best explanations of why Christianity is bad for the White Race in his book “Natures Eternal Religion”. Why would anybody aspire to call himself the ‘Destroyer of Islam’? Such a monstrous title makes no sense.—a mad project. As a White pagan, I have no use for the big Semitic religions: Judaism, Christianity, Islam. Christian armies allied with the Communists in WW2. Read the Koran, from cover to cover, and then you’ll know why “Destroyer of Islam” would be the most glorious title a leader of the White Race could have. I don’t think it’s a good thing that the White Race is being genocided in Europe by Islam and it’s “demographic weapon”? There’s a lot of truth in that, although Christianity is not homogenous and pure, it’s an agglomeration of a lot of mythology and morality that it’s picked up in it’s wanderings over the last three to four thousand years (it DOES include the Old Testament), so it’s not all bad, it’s just that it’s one of the major forces paving the way for the conquest of the West by Islam, so it needs to be called out on that, and much else. I think Ben Klassen was right, “Natures Eternal Religion”. I’m not about to waste my life reading the Koran or any other book that preaches the plastic world of religion. The so called West and their endless invasions into Asia are responsible for their own misery. When you buy your ticket, you go for a ride. I see no difference in Islam and Christianity. Both religions wage war on nature–they are rooted in equality. The Federals dictatorship on the Potomac is the premier enemy. I don’t need Klassen’s book. Living in accordance with the eternal laws of nature is all that is required. The figure for commie China may be low, I read an excerpt from what was purported to be the last biography of Mao, that author said the number was closer to 100 million, of course I have no way of knowing if that’s true, 60 million has been the accepted number.